Your license expires on your birthday. It is valid for another 60 days and can be renewed within that 60 days without having to take the knowledge test. 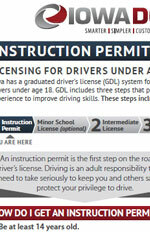 To obtain an instruction permit, you must be 14 years old and pass the vision and written tests. If you are under the age of 18, you will need a government issued certified birth certificate, your social security card, and the consent of a parent or legal guardian. A Parents' Written Consent to Issue Privilege to Drive Or Affidavit to Obtain a Duplicate License, This form is also available at any driver's license station. To obtain a school license, you will need your instruction permit, your driver education completion certificate, your social security card (if your social security number is not on your instruction permit), and you must complete an Affidavit for School License Form. This form is also available at any driver's license station. 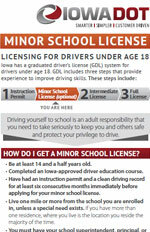 During the six consecutive months immediately preceding application for a school license, you must have held a valid instruction permit and your driving record must be clear of convictions for moving traffic violations and contributive accidents. Amends Iowa Code section 321.134 to allow for the waiver of penalties imposed for late payment of motor vehicle registration fees for an owner who is in the United States military service and relocated as a result of being placed on active duty on or after September 11, 2001. A certification from the person’s commanding officer listing the date of their assignment to active duty and the place to which they have been relocated is required before a waiver can be granted. This change allows only for the waiver of registration penalties, not regular registration fees, for members of the military placed on active duty after 9/11/2001. Repeals the requirement in Iowa Code sections 321.46 and 321.126 to submit a copy of the registration receipt to qualify for fee credits and registration refunds. The law change provides that registration receipts are no longer REQUIRED to be surrendered by owners in order to qualify for a fee credit or a refund. Lien notation fee is increased from $5 to $10, for titles processed after July 1. The new legislation provides that a notarized affidavit of correction form may be accepted to correct errors, erasures, and alterations on a title, application for title, damage disclosure statement, and other documents required for title transfers. The affidavit CANNOT be used to correct errors on odometer statements. The department/county treasurer may still reject the affidavit and application for title if not satisfied of the legality of the application or truth of any statement. Dollar amounts are no longer required to be listed on Damage Disclosure Statements. Sellers are now required to disclose whether the vehicle incurred over 50% damage in fair market value prior to or during the period of their ownership of the vehicle. A Damage Disclosure Statement is required of vehicles 7 model years old and newer. Existing cumulative damage will be carried forward to new titles except for vehicles that are 8 years old and older. Separate Damage Disclosure Statement forms must be used with titles prior to January 1, 2005. New titles will be issued in January 2005 with the revised Damage Disclosure Statement.